Literally a "calling together," Carolina Day School's Convocation assembled the CDS community on Friday, August 24, to mark the beginning of the 2018-19 academic year. 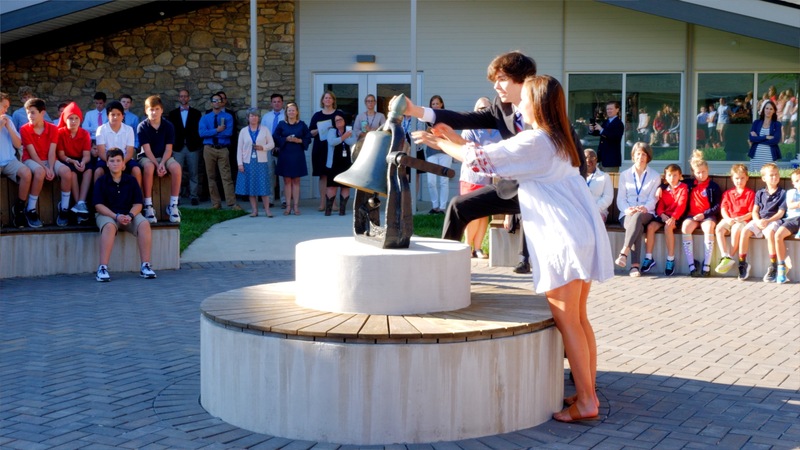 The morning began with a gathering in the Lower School courtyard to witness each member of the Class of 2019 ringing the bell—a tradition for celebratory occasions at CDS, such as Convocation Day and Commencement. We value and celebrate our school traditions, which evolve and shape our community, link the past to the present, and help us understand we belong to something larger than ourselves. Following the bell ringing, students, faculty, and members of the CDS community gathered in Nash Athletic Center for Convocation. In his Convocation address, Head of School Kirk Duncan welcomed to Carolina Day School 15 new teachers and 112 new students (19 Key School students, 41 Lower School students, 17 Middle School students, and 35 Upper School students). Mr. Duncan continued with a quote from author and speaker Leo Buscaglia: “To try is to risk failure. But risk must be taken because the greatest hazard of life is to risk nothing." "I would add that if we risk nothing, we learn nothing," said Mr. Duncan. "At Carolina Day School, we are all learners—whether you're a student, a board member, a teacher, a parent, or the head of school—we are all learners. And we are not alone in our risk-taking adventures here in the Carolina Day School community. We understand that to learn well and create imaginatively, we need to make mistakes and sometimes fail. We also need to be patient and kind to ourselves and to others as we journey together at our school—we need to lean on one another. "Speaking of which, for over three decades, Peggy Daniels has been someone that many CDS community members have leaned upon, including myself. It was announced this spring that Mrs. Daniels will retire at the end of the 2018-19 school year. For the past 34 years, Mrs. Daniels has served Asheville Country Day School, and then Carolina Day School, with intelligence warmth, and indeed caring for students. And this school year, we will celebrate her legacy of love at our school, and we will help make this the best school year ever for her and her family.” Mr. Duncan closed by saying, “Peggy, thanks for all you've done for us." The inspiring morning assembly included remarks from student body president Colton ’19 and Elizabeth ’19, and a delightful performance by the Carolina Day School faculty chorus, joined by Upper School soloists Sarah ’19 and Jack ’20. What a great way to get the school year started!